Many factors contribute to the success of a company. One is most important – our employees. In order to meet future quality and sustainability -both internally and externally- we are permanently looking for motivated and qualified employees who play a key role in shaping our corporate success. Are you interested in real estate and would like to develop with us? Are you a professional beginner or do you already have experience? You will work in small, skilled and experienced teams in an innovative and successful business environment. We offer many possibilities to find a suitable entry for you. Contact us! We look forward to you. 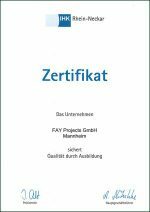 You are welcome to apply proactively to info@fay.de. Maybe this is the right job application for you?